Main Point Karlin – a dominant feature of the organic curves on the boundary between Karlín and Rohanský Island will soon become reality. These will be occupied by the second biggest local insurance company Kooperativa. It will move its employees to Prague 8 from all the buildings in the capital city as well as employees of the insurance company Česká podnikatelská pojišťovna which is its affiliated company. Both companies will make use of the entire house, i.e. over 22,000 m2. The start of construction is planned for this autumn. It is expected that the project, which is that of the company PSJ Invest and DaM architectural studio, is expected to be completed in the first half of 2011. “Negotiations with Kooperativa are being finalised and are coming to an end,” confirmed Martin Jaroš, director of PSJ Invest which is the project developer. “This is a long-term process where the client carefully verifies all aspects of a transaction and all details associated with the effective function and user comfort of the building.” Kooperativa plans to bring all its Prague operations under one roof and relocate all its activities to Karlín as part of the company’s restructuring. Its affiliated company, Česká podnikatelská pojišťovna, is to share the almost 22,000 m2 of office space that Main Point offers. As already mentioned in a press statement by Kooperativa director Martin Diviš, the insurance company wants to start construction as soon as possible so it can move within two years. 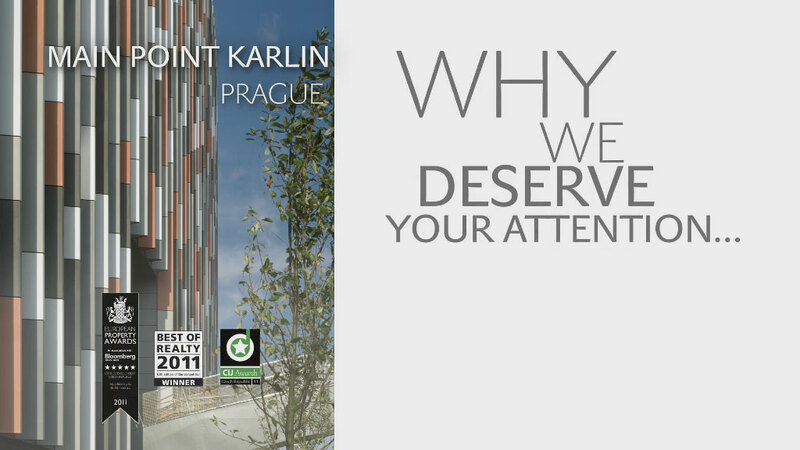 Main Point Karlin offers excellent visibility, an original architectural concept and proximity to the city centre with good transport accessibility. In view of this it was one of the favourites. It became head of the table in the choice available to Kooperativa due to its location and distinctive dynamic architecture as well as the effectiveness of the inner layout, comfort of the inside setting and efficient operation. “The aspect of operating costs played a substantial role and they will be about EUR 1 lower compared with the market at Main Point Karlin,” underlines Martin Jaroš. Moreover, the project endeavours, as one of only a few on our market, to gain the LEED international certification, and only the ČSOB central office can boast this at the moment. Currently a tender is underway for the general contractor and according to Martin Jaroš of PSJ Invest construction should begin in November. Main Point Karlin will emerge on the boundary of Karlín and Rohanský Island as its urbanisation a few years ago began with the Danube House triangular building. And Main Point on the opposite side was to have originally followed in these steps, but six years ago the idea of the triangle was pushed aside by the organic concept of DaM and its characteristic soft curves gained the favour of the investor and authorities. It turned out to be a fortunate choice not only from the urbanistic but also the aesthetic point of view, but later also the construction and commercial aspect. The location on the edge of the historical building of Karlín also bore strict regulatory conditions and the organic shape has managed to cope far better with this. “As though in nature. Where its needs to recede – it will recede and where it needs to throw light it will become rounded,” as architect Jiří Hejda of DaM looks back six years. “The shape of the building will always claim its place in its own way. It is not only an attempt to be different at all costs.” In spite of this the road to the curves was not that simple. “The line of blocks of Karlín is very strict so the classical foundation is made up of strict geometric shapes and right angles. But the boundary of the territory is so distinctive that we wanted to preserve this purity and clearly define the historic from the modern. We go beyond this boundary and therefore do not pretend to show that we are different,” explains architect Jiří Hejda. One of the inspirations was said to be an old map of the times when the port with the pier was still working and the Pobřežní Street was lined by a number of islets. So Main Point is a reminiscence of one of these. Of course, technical dimensions were also considered in an aim to make the building look interesting and impressive but effective at the same time. “To have quality jobs, energy efficiency and optimum lighting parameters,” enumerates the architect, “the organise shape allows all this and also supports it.” The investor is also happy. Unlike the established rectangle, in the end the organic ground plan with a circular atrium in the centre turned out to be better to plan. The individual workplaces perpendicularly line the circumference of the building and the inner atrium like petals. The partitions in the optimum 1.35 metre module can be created anywhere and the building is highly flexible. “All the workplaces are also next to a window so there is a minimum of less favourable dark places,” added Jakub Jirka, project manager from PSJ Invest. The space between the office “ellipses” through which three communication cores will pass, will be filled only by a corridor and conference room. So no room will be unused. It is worth mentioning the increased clear office height along the entire building circumference at the windows which is 3.25 m and together with French windows adds an airy and comfortable look to the full height of the floor in the office room. The sluice canal of the Libeň docks, which passes beneath the building, was also transformed into something beneficial. Thanks to this, for most of the year, Main Point will be cooled only by the water of the Vltava River. The engine room and dry coolers will only remain on standby and will only be used on hot summer days when the water temperature, though it also cools in the summer, will not be enough. “This will be reflected in the positive energy balance of the building,” specifies Jakub Jirka and the result effect will have an impact on a number of other elements. The building’s shape, utilisation of specially developed vertical pilasters (blinds) on the façade and outer blinds which minimises the heat gain or induction cooling. Induction units in the Czech Republic are still a novelty, even though they are frequently used in Sweden, Japan and Germany. “It is a type of cooling which is energy-efficient, if the volume of air for cooling is similar to the need for air for ventilation which is almost equal here,” explains architect Jiří Hejda, “Czech hygienic standards are very strict and either way we are driving great quantities of fresh air into the building so why not use it for cooling, too?” A third is introduced by air-conditioning and the rest is sucked in by the unit from the room. There is no need for a ventilator here, it will save energy and the operation is very quiet. Another benefit is the very low speed of the flowing air and the extremely small temperature differences in the room. “User comfort is truly excellent. You cannot hear anything and do not feel any air flow which cannot be achieved in a normal fan coil,” agrees architect Jiří Hejda and Jakub Jirka. The system can flexibly respond to all requirements of taking away or adding cooling and heating. Exterior blinds with individual control are mounted on the windows (where every other one can be opened). The regulation of all the elements – cooling, heating and blinds is highly flexible. The building allows any sort of partitioning – from cell offices, where each one has its own control to open space office with variable control modules. The building has 10 over ground floors containing about 22,000 m2 commercial space and three sublevels are intended for parking. The administrative section begins on the third floor. The spatial entrance hall with the main reception, which opens out into three elevator lobbies, is dominated by an open glass atrium enlivened by climbing plants. The height of the building corresponds to the surrounding housing which is only surpassed by the “top” of the neighbouring Danube building and the Hilton Hotel. In spite of this the building offers a pleasant view due to its variable curves through the glass belt of French windows at all its levels. “All of the old town, Peter’s Quarter, Karlín and Vítkov will be visible from the south and southwestern side, a view of the Vltava will open from the north-west and Letná will be seen at a wide angle between the Hilton and Danube House building. Some windows will also provide a view of Hradčany,” described architect Jiří Hejda. The lower section of the building will be cut up to a height of two floors by a public arcade which extends from the footbridge on Rohanský Island to Florence on a quiet and elegant square. On the contrary, the two highest floors towards Karlín recede in favour of green terraces. “We are a bit annoyed as the building could have achieved even greater purity,” adds the architect. However the work has proved a success and Main Point Karlin has combined an interesting design with logical functionality. The developer of the Main Point Karlin complex is PSJ INVEST, a.s., which has been developing its activities in residential, administrative and retail projects for a long time. Some of its most important projects are the office buildings of Prague’s BB Centre in Prague Michle and the City Park business and entertainment centre which opened last in the centre of Jihlava with 26,000 m2 of retail space. PSJ Invest director Martin Jaroš sees future prospects in the development of office and flats in good locations especially in Prague. In his opinion the retail market has become saturated.